It is a truth universally acknowledged that a writer in possession of a good imagination must be in love with Pinterest. My own realization of this truth led me to thinking, "What if writers tried to take over Pinterest for a night?" 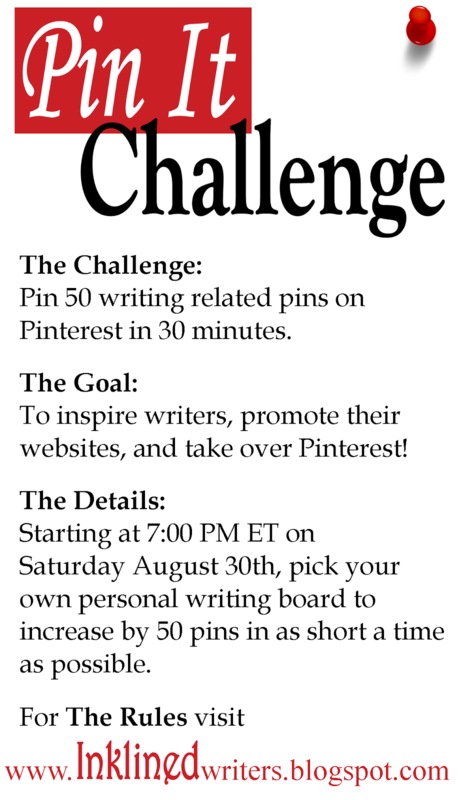 Pin 50 writing related pins on Pinterest in 30 minutes. That's a pin every 36 seconds, if you were wondering. To inspire writers, promote their websites, and take over Pinterest! Starting at 7:00 PM ET on Saturday August 30th, pick your own personal writing board to increase by 50 pins in as short a time as possible. Record the number of pins already pinned and then start pinning. Don’t stop pinning until you’ve added 50 pins to your board. Pins may come from anywhere, other boards, outside websites, or your own hard drive. Pins that count toward the challenge may be any type of content you find relevant to writing, including but not limited to these: quotes on writing, writing how-to articles, writing inspiration, book covers, setting and character inspiration, ect. 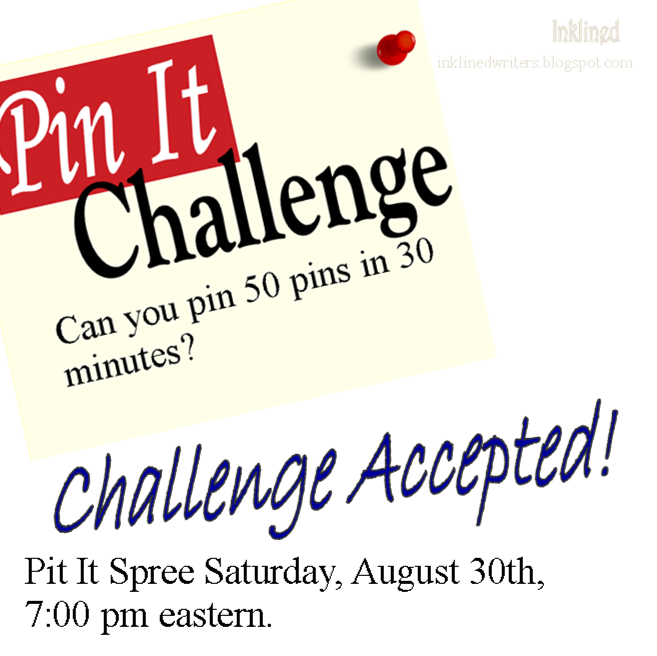 If you pin 50 new pins in 30 minutes or less, you complete the Pin It Challenge! 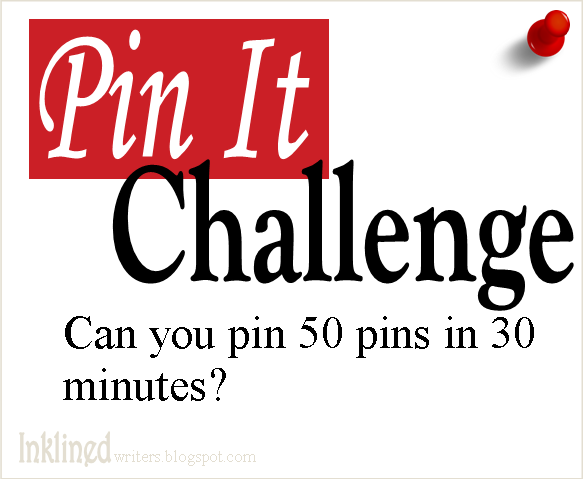 At 6:59 PM ET, pin the Pin It Challenge Accepted image onto your challenge board. Once you’ve reached the 50th pin, add the Pinned it Image to your board and/or tweet about your success using the hashtag #PinItChallenge. If you’re joining the challenge be sure to add your writing related Pinterest board to the link up below! All of these are totally option, the only things required to participate is a Pinterest account and an internet connection. I so hope you get to join the challenge! If you write a blog post about it, I'd love if it you'd leave the link to your post in the comments! Don't forget to add your Pinterest board to the link up! Do we have to pin the challenge accepted pin when the actually challenge begins or when we accept the challenge.